Tourists going on Costa Rica’s Mi Cafecito Coffee Tour can have a cup of Joe that other tourists may have played a key role in. 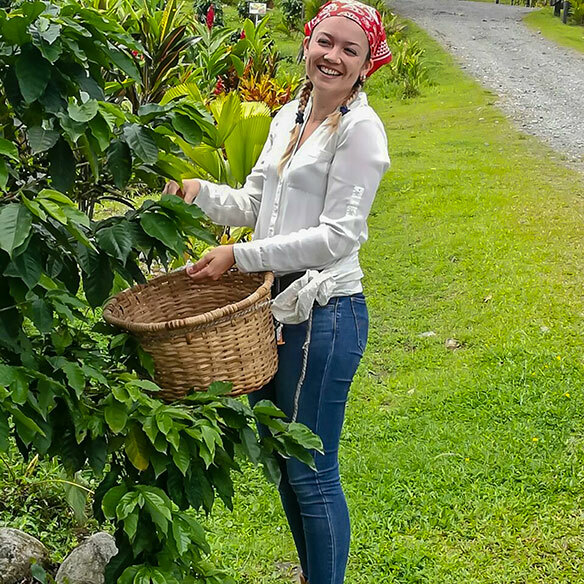 The tours, found near interior Costa Rica’s Poas Volcano, can have visitors both plant coffee and pick coffee beans, says the attraction’s Verónica Cubilo. “You can learn about the history of coffee,” Cubilo continues. The tours – which invite people to take a coffee break in Costa Rica – also provide insights into the lives of those Costa Ricans who produce coffee. The Mi Cafecito Coffee Tour is a cooperative that’s involved over 200 small farmers in northern Costa Rica. The project meets Fair Trade standards. Both 80-minute and 2.5-hour tours are available, with the latter including a Costa Rican lunch. Visitors can also produce sugar cane juice and tortillas – like coffee, popular in Costa Rica – and hike through forest trails that provide sightings of numerous bird species. Cubilo says coffee from the area tends to be sweeter than that from most other areas. Coffee produced by Mi Cafecito Coffee Tour is sold on-site. Local guide Katherine Rojas says it’s not surprising many foreigners touring Costa Rica work their way to the Mi Cafecito Coffee Tour. “Tourists are interested in coffee,” she states. Those wanting more information can go to micafecitocoffeetour.com .